Flashpoint: A John and Mary Bolt Mystery by Linda S. Bingham is the second book about an arson investigator and his new wife. While John and Mary fan the flames of their desire on a delayed honeymoon, John's best friend, Harry, is about to tie the knot for the fifth time before a few select ex-wives and sundry other greedy relations. The only question is why has the groom vanished like smoke? And as in the first mystery, where there is smoke there is sure to be fire! Flashpoint is set on the private island of Coeur d'Saint off the coast of Saint Maartin in the Caribbean. John Bolt, an arson expert from an Insurance company in Houston, and Mary Yates, an actress with the San Francisco Deaf Players (stage name Alyssa Henry) have been married for nine months and are due for their delayed honeymoon. The perfect opportunity for a honeymoon comes with the invitation to attend the wedding of John's best friend, Harry Tepperwein, on his private island in the tropics. This in fact will be Harry's fifth wedding and surprisingly to a much younger barmaid. It is surprising because Harry has stopped drinking years ago. On the way to the island, John and Mary have another surprise - three of Harry's former ex-wives will be in attendance. Ellen, Harry's first wife, is almost completely deaf and is supportive of the young bride-to-be. Maureen is wife number two and a former beauty queen. Harry had her committed and she is clearly still heavily medicated and unstable. Patrice, Harry most recent wife, is hurting and bitter. Tightly clutching her briefcase, she swears she has found evidence that will stop this wedding before a single note of the bridal march is sounded. Brandy, wife to-be number five, is young, perk, and suffering more than the usual bouts of wedding jitters. (If you are counting, wife number three died in France.) Add to this dangerous cocktail, an assortment of impoverish sons and greedy relatives, a collection of odd servants and some restless and superstitious natives. For excitement add one plot twist from an extinct volcano and garish with one very mean and very powerful drug dealer determined to reclaim his former home and island. Shake, don't stir. Sit back and sip the intoxicating brew. 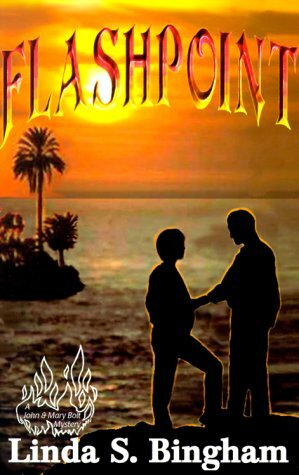 Flashpoint: A John and Mary Bolt Mystery by Linda S. Bingham is a "cozy mystery". It is short on thrills, big on romance, and this one is big on Caribbean atmosphere. It is a wonderful beach book.